Babywearing has been around for ages, although many seem to think it’s a more recent phenomenon. There are many different types of baby carriers, from ring slings to wraps to soft-structured carriers. The benefits to babywearing are many, including reduced crying from babies, an increased feeling of parental competence, and increased bonding. We realized all these advantages and more as we dealt with colic, post-partum depression and other challenges. We didn’t babywear with my first child, Alexa. The amusing (and somewhat regrettable) fact is that we had a Moby Wrap but never used it. I was a bit intimidated to try it out and just never took the time. Looking back I really wish I would have. My daughter was definitely an in-arms baby so most of our time was spent holding her. She would only nap on my chest. I can’t help but think of how much easier life as a first-time mom would’ve been if I’d just taken the time to learn how to tie the Moby, especially since using it becomes second nature after the first few times. When we were pregnant with our second child I knew I wanted to try babywearing. It seemed logical to wear my baby and have two free hands for my toddler. Little did I know, babywearing would become an integral part of my life as a mom of two. Babywearing made life as a mom of two so much easier. We could head out and I didn’t have to worry about where to park a stroller or set an infant bucket seat. When we went out for long errands I had Alexa sit in the shopping cart while I wore my son, Preston. When we played at the park, Preston was right there seeing the sights and experiencing it all with us. I didn’t leave the house without my Moby wrap. I joked that I needed two, one for babywearing at home and one to leave in the car so I never had to worry about forgetting it. There wasn’t a day that went by that I didn’t wear Preston. When my son was about three weeks old he became very colicky. Babywearing was a lifesaver with a colicky baby. As any mom who has been through colic knows, wearing him in the Moby didn’t always do the trick, but it was high on the list of things we tried to help calm him. We soon found that he was calmer during the day if I wore him, so I did. There were many days where I tied the Moby on first thing in the morning and had it on all day long. He was comfy in there, he was close to me, he could look up and see that he was safe with his mom, and I was able to spend much needed quality time with my daughter. Evenings with a colicky infant were more difficult, but babywearing was always part of the long list of things we tried to help comfort and calm him. Many moms state there is a learning curve to getting out of the house with two children. Dealing with post-partum depression (PPD) made this learning curve steep. Research has shown that babywearing can make things a little easier for moms struggling with PPD or depression. Having Preston close helped with our bonding experience and also allowed me to provide care for my daughter, family and self. When Preston was about four months old we started transitioning to using the Ergo. I really liked it and, after some adjustment, so did he. Shortly thereafter I injured my back, which really threw me for a loop, so many of my daily activities relied on the ability to wear my son. I’m sure I got more than a few laughs when I posted “How do moms of two survive without babywearing? ?” on Facebook. It certainly was a change for us, but it was the start of my husband regularly wearing Preston. Babywearing is a great way for fathers (and other caregivers) to bond with baby. My husband marveled at how comfortable the Ergo was and now we both wear Preston regularly. It turned out that babywearing was much more for us than just the logical choice for a mom of two. Between dealing with colic, post-partum depression and the normal issues that go along with becoming a family of four, I can’t imagine life without babywearing. 1. For more information on the different types of carriers, read Choosing a Baby Carrier from Babywearing International. 2. 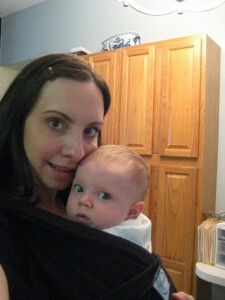 For tips on safe babywearing, read International Babywearing Week: Safe Babywearing by Lauren at Hobo Mama. 3. To learn more about the recent recalls on sling style carriers by the U.S. Consumer Products Safety Commission (CPSC), read the Position Paper on Babywearing from the Baby Carrier Industry Alliance. Kristen blogs at Adventures in Mommyhood where she shares her experiences with natural parenting, food allergies and post-partum depression. As much as I love babywearing my son (who’s my first kid), I think it’d be even more helpful when you have more than 1. When I see a mom at the park with a newborn in a stroller alone by the picnic tables while mom pushes an older sibling on swings & such, I just want to run over and give them a baby carrier! Seems so much more convenient and way way safer. I wonder why more people don’t use baby carriers?? I feel exactly the same way! Almost like if they only knew how much easier it could be they’d love babywearing as much as I do. I love when new moms of two ask me about my carrier; I’m sure I give them more info than they ever wanted! I also feel that it would be very hard for me to feel like I was meeting both of my kids needs if one was parked over in a stroller and the other on a swing or etc. I’d feel pulled in two directions. I love babywearing my son so we can all be together. This is a great post Kristen! Babywearing made things so much easier when Moira was an infant, and I’m sure it will be a life saver when we eventually have two. A back injury led to daddy baby wearing in my house too, much to my surprise he now enjoys ‘the cuddle’ and I am often refused when I offer to take over. We have a carrier just for the car, it seems excessive but we put the cost of carriers above the cost of our pram and I don’t regret that choice. My husband loves wearing my son now too. Whenever we all go out he usually is the one to wear Preston, partly because I still have lingering back issues but I also think he really loves the snuggle time too. Great post! I love keeping my baby close. When Jac had acid reflux as an infant, babywearing was especially helpful because I was easily able to keep him upright for a half hour after he nursed, which greatly helped his digestion. Having my son upright after nursing really helped us here as well. He had mild reflux, which we later discovered it was due to multiple food sensitivities. Well said 🙂 Babywearing was a huge part of the maintenance of my sanity, even as a mama of one (and of course a wonderful tool for keeping my girl close, too), so I can only imagine how much it will come in handy if we add another child to the mix! I’m with you on every count! Boy, how it becomes necessary to wear the baby on my back in order to cook dinner some nights . . . . I totally understand the intimidation of first trying a sling, any sling! And sometimes different slings work better for different kids, or maybe it is the mom… I liked my ring sling 12 years ago, but now I prefer my Mei Tai. Nice article about your sweet family and the many benefits of baby wearing! I totally love babywearing. As a working mom, I need to make every minute home with my son count, and wearing him has allowed us to be close while I go about doing things that need to get done around the house. The only time we ever use the stroller anymore is if we need a “shopping cart” when we go out. Our bags go in the stroller, my son goes on my husband or me. We haven’t used our stroller at all with my son yet, but I’m thinking it will come in handy as soon as the farmers markets start up! Great article, Kristen! I never got the hang of my Moby (or how to keep it from getting soaked in puddles when putting it on outside), but Liam spends a lot of time in the Ergo. You were smart to buy a more neutral one than I did so that Daddy would feel comfortable using it too. My secret to not having the Moby get wet was to put it on before we left the house. I have a friend who could tie it while holding the length between her knees, but I felt like it was easier to just try and remember to put it on before heading out. without the sling i dont know what id do. i weared my first born but my second is worn everyday lots of times 🙂 and yes with an energetic toddler i wonder how ppl can use a stroller….